By Elizabeth Flock, Washington Post: It’s not often that District readers get to learn about a man who is so much a part of our daily lives without us ever having known anything about him. 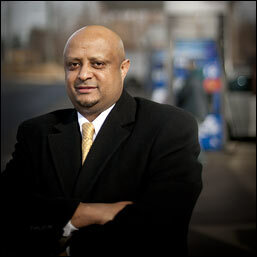 Mamo moved in 1981 to North Dakota from Ethiopia, where his father ran the first fleet of buses to provide service across Ethiopia, and landed by accident in Washington six years later. The profile depicts a Mamo that’s hard to pin down. A trade publication writer says he has a “mystique.” He’s got a reputation as an aggressive businessman. MacDonald describes him as “humble” and a “jobber,” and a taxicab mogul calls him a “rags-to-riches” immigrant success story. These qualities, however, are clearly what allowed Mamo to go on a buying spree for gas and thrive while others in the industry were driven into bankruptcy. It might also help that Mamo has contributed $52,750 to D.C. mayoral and council candidates since 2006, wooed oil executives and supported Jesse Jackson. The only guys who don’t like him? D.C.’s mom-and-pop gas station operators. The profile is a long, fascinating read, unsatisfying only in that we never seem to really get to know Mamo in the five pages. But perhaps that’s more telling of the man than the writer. Read more at the Washington City Paper.